This was a piece from a couple of years ago that was published in the Globe. I finally reached that age when it was time to get a tattoo. There is a fine balance between the years you can appreciate your tattoo and the years that you finally regret it. Turning 60, my years of tattoo appreciation seemed likely to exceed the years of tattoo regret. Only 10% of my age bracket, the baby boomers have a tattoo. Moving from the middle of the pig in the python, I was on the verge of being an outlier. My spouse got her own tattoo as a 50th birthday present. A nice Celtic knot on the side of calf. I have admired her determination to show who she was and an insight into her heritage. The only thing that people could tell about my heritage was that I came from nice hair. Getting a tattoo would reveal my inner rebel. Getting a tattoo, and a motorbike, would go hand-in-hand. My spouse did point out the error of that logic, and a tattoo was a stand-alone rebel stance and would not require a motorbike. My rebel was appropriately schooled. What tattoo could do this, without the motorbike? Latin phrases such as carpe diem have been done to death. The best approach would be a symbol. I was looking for something that spoke to me and represented what being human was all about. No easy task since people search all their lives for personal meaning, and I was looking for something like that that could fit on my slightly increasing, soon to be decreasing body size. In the time that it would have taken to gestate five consecutive baby elephants, I finally set upon a design. A triskelion. A three part symbol that even predates the Celts. The interesting aspect is that you can apply any meaning you want to a trinity. Past present future, mind body spirit, grande decaf latte. The last is a bit of stretch, but the symbol is multipurpose. I wanted to include my wife’s initials in between the spokes of the triskelion. My spouse smiled. My adult children mildly rolled their eyes. PDAs, parental displays of affection, are to be avoided. The placement of a tattoo also makes a statement. Men prefer arms while woman prefer upper back and legs. Each placement makes a different statement. A facial location would make the statement that I was not happy with my present employment. A deltoid shoulder placement was more in keeping. Not too shy, not obvious at work, and would integrate well with the yoga crowd when I wore my lululemon tank top. This was the way to show my free spirit. I copied out varioustattoo sizes and taped them to various body locations. Apparently my free spirit likes to be guided like a slow moving trolley on tracks. After contacting my local tattoo parlor, and checking out needle safety, I had my consultation. I veered away somewhat from the artists that would otherwise have been comfortable providing prison tattoos, while in prison. I settled for a more artistic looking artist. The fateful day arrived and I was feeling flushed and decided to walk to the tattoo parlor instead of driving. I loaded up on ibuprofen. Upon arriving, I signed the necessary forms. There was no legal jargon to pour through. A good sign. I sat down in the dental looking chair, not a good sign, and my artist explained the process. He applied the stencil and I checked the mirror. This was the one last chance to bail, but I smiled and said ‘hey, it’s exactly what I was thinking of’. This may have been true at some point, but my mind was blank. I leaned back and closed my eyes. I can just about fall asleep when getting my teeth cleaned. I decided that I should try to stay awake and become more ‘fully engaged’ in the moment. But I was more concerned about my tattoo artist. If he nodded off and didn’t move from a certain spot after a minute, I wondered if I would be left with a large black splotch. And if so, what would this very unhappy looking death balloon symbolize? The entire process took less than 90 minutes. I had been warned that getting a tattoo was like getting scratched by a cat. My previous scratching experience was rescuing a friend’s cat from a tree. The cat was terrified, but I coaxed it to leap into my arms. Yes, mistake, scratch wise. Fortunately getting the tattoo was way less painful. When my artist was finished I paid the balance of my account. I gave him a nice tip. Even though the experience is almost the same, countless small punctures, I don’t usually tip my lawyer or my accountant. Afterwards, I did feel different. After thinking about the meaning of the design, I understood how people can feel that their totem, crystals and the like are channeling another power. We all like to be attached to something greater. 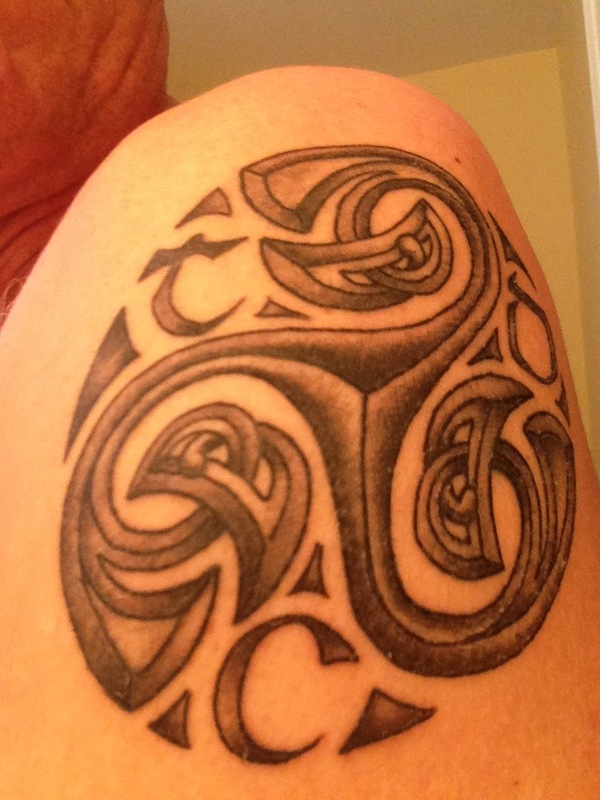 The triskelion reminds me to work on all aspects of myself continuously, a permanent conscious guide. I like how they worked my spouse’s Celtic initials into the design which shows how our past, present and futures are intertwined. I have committed to things that are important and to leave aside things that are not. There is no time like the present. Why wait?